Per usual, I’ve been slacking. Well, sort of. My knitting and sewing projects have been put on the back burner, mostly due to the fact that Lucas and I’s wedding is coming up next month! Yes, I can officially say that our wedding is next month. With that being said aloud, I feel like there are hundreds of things to do in a short amount of time even though I know the major things are taken care of. We officially purchased our wedding bands last night, the last BIG thing on the to do list. Favours have been ordered, my dress fitting is coming up in less than a week, we’ve ordered the personalized matching shirts we plan to wear after the wedding, and I’ve even found time to work on something secret and crafty for Lucas as a wedding gift. Unfortunately I cannot disclose that yet, but you can be sure it’ll be posted and blogged about soon enough next month. Look out Vegas, here we come! So what have I been doing crafty in the meantime? I’ve stumbled upon digital scrapbooking! Not just recently, but it was only recently I’ve had time to put into giving it a go. Back around Christmas I ordered some really awesome software that got me all excited about the prospects of digital scrapbooking: My Memories Suite by Polaroid. I’ve got several scrapbooks in the basement collecting dust because they’re unfinished. Mostly due to lack of nifty embellishments that you’ve gotta shell out loads of cash for, not to mention several trips to the store to buy. I keep meaning to get back to them, but instead I keep photos and items like movie ticket stubs in a box for whenever I finally do get around to working on them again. Those boxes are collecting dust, too. Back just before Christmas when I was home one day I caught one of those infomercials. Now I know what you’re thinking… BUT this one turned out to be a gem! I watched an hour long program about My Memories Suite and it got me really excited. The idea that I can scrapbook without messy glue and 348993639749574908 little things to have to keep organized (not to mention buy in the first place and then store somehow) on a computer seemed like a really fab idea, especially with as computer geeky as I am. And it is fab! I bought the software and used it to make an album of Lucas and I’s holiday trip to Indiana to visit my family at Christmas. The program made it really easy and it’s soooooo user friendly! With the wedding coming up next month, I decided I’d try to make our own guest book, and of course I will be making a digital scrapbook album of the wedding itself. I started looking into digital scrapbooking more on the web and have found lots of great, creative resource sites out there. The best part about My Memories Suite (to me) is the fact that the software uses common image file types such as .jpg or .png, which means I am free to add all kinds of new images myself to the software’s directories. Most of the other digital scrapbooking software I tested in comparison to My Memories Suite uses unique file types of their own, so that means you are limited and cannot “think outside the box” and add your own new stuff to use without having to pay the company for new products. This excites me because I’ll be able to use our scanner and scan in images of movie ticket stubs and other items I’d normally glue into a regular scrapbook and add them digitally the same way, just with less mess. It doesn’t really matter what your computer knowledge or creativity limits are, you’ll be able to use this software. It’s very user-friendly and simple, and for those who aren’t sure where to begin, it comes with loads of pre-created templates for various occasions. You can also download more layouts and completed templates from their website for a small fee. But then the beauty, as I mentioned earlier, is that if you’re creative enough you can easily add more images and items to the software yourself since it’s all done with .jpg and .png formatted images. For example, I found some awesome digital scrapbooking blogs and websites that offer free templates and kits — a kit usually including various papers, embellishments, and word art or alphabets — for download. There’s lots of people out there making really awesome digital scrapbooking resources and making them available free or super cheap. With My Memories Suite, you can easily download freebies and add them to the software’s directories and use them with the program just like any of the pre-loaded content. This makes the potential of My Memories Suite limitless to me because I’ll always be able to add more. And I’m just starting to look into how I can make my own digital page kits and getting the hang of designing my own templates. It’s so fun! For freebie downloads, you HAVE to check out DigiFree, which has moved to CraftCrave. DigiFree is a digital scrapbooking search engine, and each day it automatically searches for you over 3,000 digital scrapbooking blogs that give away freebies to find the newest freebies and then posts them all on the DigiFree blog.Â So it’s your one-stop-shop for ALL of the latest digital scrapping freebies within 24 hours of them being released.Â There’s TONS of freebies every day — make it part of your daily routine! Â Download free kits and designing resources, too :)Â DigiFree is the greatest thing to happen to digital scrapbooking freebies.Â Ever. Whew! Well that’s it for now, sorry if my rambling post sounded a bit like an infomercial. I swear that Polaroid did not pay me to write good things about their software — it really is awesome and I love it! I’m super excited about upcoming album ideas I have. I’m totally done with the old way of scrapbooking. It’s too messy and expensive in comparison! 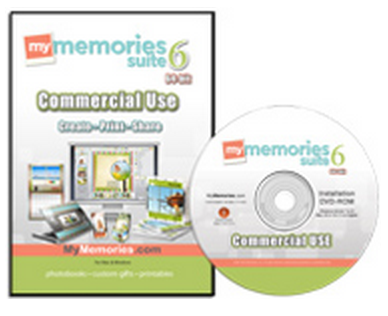 My Memories Suite V2 SAVE $10 off Regular Pricing + get $10 towards site downloads, ORDER NOW! Thank you again, and hope you have a great week! I have been reading your comments about My Memories Suite with interest as I am new to digital scrapping and considering purchasing My Memories Suite. I am wondering if you have scrapped with Photoshop Elements and can compare the two. I am trying to decide which to purchase. thanks and your site is sooo helpful!!! I own Photoshop Elements, but never use it, so I can’t say I can give a fair assessment! For me, PSE is used for design and manipulating stuff to make scrapbooking elements (and though I have it, I prefer plain-old Photoshop CS2) and My Memories Suite is for putting it all together into scrapbook form with all of the extra options and exporting abilities. But again, I’ve not tried using PSE for scrapbooking so I can’t say for sure! Sorry — there might be someone else out there that uses it and you might be able to find a review that way. Try asking also on scrapbook.com forums in the digital scrapbooking forum — I know there are people there that use PSE for scrapping. Good luck! thanks for your reply! I just watched your tutorials–they were excellent–so helpful!!! thank you so much! I think I am going to order the software–I just need to make sure that my computer system is new enough to run it (I have windows xp sp3 with 1.3 GHZ processor and 512 MB RAM). You’re welcome! I found the computer spec requirements here: https://www.mymemoriessuite.tv/features.aspx It looks like your machine will work :) XP is fine and at least 1 GHZ with 512 MB RAM. Good luck!! Hi, I saw this on TV, only caught part of it so looked it up on the internet. Looks like a wonderful program but I finally called them this morning to check on the dpi export since I could not find that information. They told me it only exports at 72dpi but when you send it to their printers it is printed at 300dpi??? I am so confused I thought the scrapbook standards were atleast 200 but 300dpi was better. They told me I could print it at 300dpi with my printer even tho it was expoted at only 72dpi. What is you opinion on this. Thank you. I exported a page to test and indeed it was 72 dpi resolution when I examined it in a graphics editing program. I have not tried printing my own pages myself — so far I’ve had things sent off to Polaroid to be printed professionally and bound into a photo book because I don’t have a way to personally print 12 x 12. The results were amazing quality that I received from professional printing, though, for what it is worth. I assume they print at 300 dpi (I create things at 300 dpi) — but I don’t know. I’ve not had any problems with my quality, though! Sorry I’m not much help. Good luck to you! I just installed the software and love it!!! Your tutorials have been so helpful. I am wondering if you have had any pages printed by any means other than Polaroid? I ask as I would like to create a some pages that I will incorporate into a “paper” scrapbook, so I just will need a few pages individually printed–not a whole bound book. Thanks again! I just wanted to let you know and the previous poster that the print quality is great even without using Poloroid. I had a 12 x 12 loose page printed through sbtoshare.com and it came out great. I was thrown off by the 72 dpi, but no problems with quality as it is 3600 x 3600. I have another question. Have you found any way to search within or without the program. I am finding that I have trouble remembering where things are–for example in making a book on my Mexican vacations, I found some great embellishments in recipe and a background I like in Winter–not places that readily would come to mind. I was wishing I could seach within designer embellishments for strip or mat- or even by color-have you found any way to do that. I use picasa to organize my pics, and it has grabbed all the objects from the software, so I wondered if there is not a way to search within the software, if there is a way to incorporate a search outside the software? Thanks for getting back to us and updating us on the print status after having your pages printed through sbtoshare.com! I will definitely check them out now. I, sadly, do not know of a way to search within the program through all of the directories to find specific files or design types/colours/etc. I sure wish there was a way! I, too, know of some sets I’ve downloaded or purchased that have some really cool embellishments that I think would be great for “such and such design” and then when I get around to making that design, I forget all about the embellishment because it’s in a folder that has nothing to do with the “such and such” subject. My only suggestion is to create a separate directory that you call “Mexico” and copy any embellishments, etc. from other folders that may not have anything to do with Mexico and put them in your Mexico folder so you can find them later. I’ve done this a few times, and then once I put things into a new folder I’ll rename them with the name of the kit it came from and the designer so that I can credit properly later when I display things. That make sense? I know it’s a pain, but I don’t know any other way! Thanks again for getting back to us on your print experiences! I just watched your tutorial about using background paper as layers. I was just wondering how to do it so it was great! I couldn’t figure out how to do it and was feeling bad that I had all these great background papers that I thought could only be used as the entire background. So your tutorial was wonderful news!!! I really appreciate the effort you have gone through to create them. After watching the tutorial, I started thinking. With regard to embellishments that are downloaded–why bother putting it into the mms program. Why not just click “add a photo” (not photo box) and then scroll through your scrap downloads directory? It seems you can do the same things with photos as embellisments and you could save yourself a step by just unzipping them and not having to copy them into the mms program. I tested it out and was able to add an embellishment that way. I am just wondering if you can think of any reason not to do it this way. I am also thinking that if i keep the embellishments outside the program, I may be able to figure out a way to use picasa to tag them so I can search them. So glad the last tutorial helped! It was the inspiration for doing more tutorials because it took me awhile to figure it out — I knew there just HAD to be a way to achieve that! I thought I would let you know–I was able to use picassa to organize all the mms backgrounds and embellishments. This way I can do a quick search in picassa for objects by color, mat, ect. I didn’t tag or reorganize anything as mms already has each object named. For me this is great as I can do a quick search to refresh my memory as to everything. Also it’s nice to quickly scan through backgrounds, as in mms, I have to click on each background to see it. I also am using Picassa to organize all downloaded stuff as well. I am not moving downloaded objects into MMS, but rather searching within picassa and then dragging the specific object I want onto my page in mms. I have to thank you again for that tutorial or it never would have occured to me that I could do this. Hey, no problem!! Thank YOU for the suggestion and combo of using Picassa to make this easier… I may have to do it now! :D Thanks! I don’t know if you are already familar with Picassa. I used it for my photos, but a few things I had to figure out with regards to scrap stuff. To get picassa to organize the backgrounds and embellishments from MMS, I had to open picassa, go to File, add folder to Picassa, and then go to MMS components and only add backgrounds and embellishments. Also, I had to remove from Picassa the MMS albums as if not, picassa will grab all the elements used on each page in the album and organize them again. With MMS items, once I see what I want by doing a search in Picassa, if I remember where the item is located in MMS, I just go into the MMS program and add the tiemm as usual. If I am not sure exactly where it is in MMS (ie which category in designer), then I right click on the item, “locate on disk,” and I am brought to MMS components and can see exactly where the element is located in MMS. Then go into MMS and add it as usual. You may already know all of the above, but I had to figure some of it out, so I thought I would share it with you in case you are not a picassa guru. Have you added videos and created a DVD to play on TV? Can the software put together multiple videos on one page or are they all separate videos that need to be selected separately? Also, can you create special edges for photos and embellishments? For example, a softer edge or a torn paper look? What about adding text, are there more options for enhancing text? Also, have you (or anyone) printed the scrapbook pages to a home printer? Sorry for all of the questions, I just want to be a little more confident that this software will work for me before I buy it! Thanks for all your help!!! So far for the DVD creation part I’ve just made my flat, static pages into DVD format — and all it does is set up each page as a slideshow automatically. The turnout is great on our TV after we burned the DVD, but I am not sure how it works when you have embedded video on each page or how it handles multiple videos on the same page. I don’t think there’s anything for creating various edges on the photos and embellishments — I tend to do that in Photoshop and then bring items into My Memories Suite. As far as text goes within the program you can add text in any font and choose its colour and whether or not it has a drop shadow, move it around and choose what angle to make it, etc. but nothing fancy like you’d get in Photoshop for manipulating text. Hi…thanks for all the good info on My Memories Suite. I think I’m sold on buying it. I was wondering if they have a lot of Heritage templates available in the software. I’m thinking of making a Heritage Album for my mother-in-law. I noticed that they have a separate package for 19.99 called Life’s Journey. Are you familiar with the package, and if so, does it include Heritage type pages. Thanks for all your help….I’ll be visiting again. The Heritage theme set comes with My Memories Suite, and you are able to use any of the page layouts from it as many times as you want to ensure you have enough pages for your project. And of course, once you do so you are able to change any aspect of the page around to your liking. You’ll have access to the raw Heritage files (backgrounds, embellishments, etc.) that make up the Heritage layouts that come with the program, so you can design your own page using the Heritage elements that you see in the layouts. I don’t know anything about the separate packages on the website. Good luck! Hi! Before I can justify spending this kind of money…I have the latest Macbook and I’m looking for alternate slideshow software for Mac. I like how the pages are not “bland”! Since you can add video, captions, etc., how about transitions? Does the software have transitions? It’s too boring to just go from slide to slide. Is there a link where I can view a video sample of just what this program is capable of? There are no video transition options — the only settings I can see when I choose to “Burn to DVD” or “Make a Movie” is the amount of seconds a page is displayed before it switches to the next page or slide. If you are looking to make a movie with transitions, there may be a Macbook or Mac equivalent to Windows Movie Maker and/or Windows DVD Maker. I used a combination of these programs to drag and drop in transitions between slides for this very thing — I just added in the pages as the JPGs derived from My Memories Suite and then could add in transitions and effects. I realize this doesn’t help you with a Macbook, but I’m sure a Google search will come up with similar/equivalent software for the Mac. My Memories Suite is first and foremost digital scrapbooking software meant for creating digital scrapbooking layouts of your photos and embellishments similar to traditional scrapbooking. Because My Memories Suite is digital, though, it does have some really nifty other output/export formats for sharing your scrapbook once you’ve created it — such as burning to a DVD and making a slide show of your pages, sharing online and such. HOWEVER, because MMS is first and foremost digital scrapbooking software, those extra output formats are fairly basic. It does allow you to share your scrapbooks in other mediums but for more advanced options such as transitions and such on video, I’d recommend pulling the output into another more advanced software whose main purpose is to add transitions and video effects beyond MMS’ capabilities. For example — I created a full digital album (that I then exported for printing into a traditional book, which turned out fabulous!) and also exported the album into a video/slide show format. I took this slide show format file and pulled it into Windows Movie Maker to add transitions, saved it, and then pulled THAT file into Windows DVD Maker to add a formal DVD title screen with clickable options — so then when I burned it, I ended up with one DVD that I put the video taken of the ceremony on as well as the slide show format of our wedding digital scrapbook album and had a clickable main screen menu so you could click to choose and watch the video of the ceremony or view the scrabook album. Bottom line: While My Memories Suite has great additional options for outputting your digital scrapbook to share that most other digital scrapping programs do not have, including burning it to a DVD or making a movie (slide show format) or exporting as JPGs for printing or posting online, it is first and foremost just for digital scrapbooking. The additional output formats are nice but basic — more advanced options beyond basic DVD burning and basic movie making are better done with software meant for that purpose. (i.e. movie making software). You can see how it transitions between slides — how it fades between the slides. I am interested in the software. I know you can download it or buy the CD. My question is that if you download it and want it on another computer is that possible? Sorry, Cindy! No way to do that. Some ways around that would be to have torn paper embellishments (so embellishments that look torn already) or embellishments you open and modify in Photoshop to have a torn edge and then save and open/use in MMS. My Memories Suite can do some pretty darn cool things but it’s really a scrapbooking software vs. a photo editing/manipulation software. It does have basic photo editing abilities (as I’m sure you’re used to with V1) but it doesn’t have the capabilities to the level of Photoshop to create a torn edge. It might be neat if somehow that *could* be implemented – maybe suggest it to the company or mention it on the Facebook Fan page? http://www.facebook.com/pages/Polaroid-My-Memories-Suite/54853441440 :) Good luck! I have some albums that are more than 28 pages so I am not sure what is happening. Perhaps contact Customer Support and let them know you’re unable to go beyond 28 pages. I know back when MMS first came out, 26 pages was their limit for printing a photo book (If I remember right) but I thought that was just if you were printing a book through them. I definitely have albums longer than 28 pages so I know it can be done, and I don’t remember doing anything strange to go beyond 28 – I just kept adding new pages and designing them until I finished the book. Maybe check with Customer Support to see what’s going on. Good luck! Hi lesley. I just watched your mms tutorial 1 on youtube. You did a fantastic job! I am pretty much sold but since the video is older i wasjust wondering if you still use it. Are you aware of any current issues with the program? Also i would be using it on a mac. Thanks! Thanks! Glad you liked it. I still use the program (now on version 3) and love it! I just had my son’s baby book printed. I want to thank you for your great videos on how to use the My Memories Suite software. It was very helpful. I have 2 questions. Do you have version 3 of the software? I was wondering if you thought it was worth the upgrade in your opinion. Secondly, I have had issues downloading free digital kits. I keep getting error message saying the file may be corrupt. Is ” (file name) may be a corrupted image file. java.lang.NullPointerException”. Am I doing something wrong? I have version 3 of the software. It has quite a few convenience upgrades that I really find helpful that version 2 does not have, however, since all of my tutorials were made for version 1, I know the software is fabulous and totally functional no matter what version you are on… just know that there are a few little things that you might find easier if you have upgraded. But all of my tutorials will work with version 2, and you can do amazing things with just version 2. The error you’re getting, are you getting it while in My Memories Suite? What version of Windows do you have? There is a known issue (check out my blog post here: https://www.thepinktoque.com/tutorial-my-memories-suite-error-resolved ) that sometimes happens, and there’s a way to get around that issue by using administrator mode when you run MMS. It was an issue in Vista, but I’m guessing it may still be an issue in Win 7, too, so give that post a look and see if it helps. Otherwise, just saying “ok” or “yes” to the “error” in MMS is fine – it won’t hurt anything and you can still use the image(s) in question, it’s just annoying to have to click everytime the error pops up, so it’s good to check out the error blog post to take care of that error “permanently.” Good luck! I honestly don’t know about MM Wedding Studio; I’m guessing anything that is tailored very specifically to wedding would be the best choice, but I haven’t used it. I have never made tags in MMS but I guess you could probably do it – if you’re planning to purchase MMS perhaps buy it first and see if it can do what you want that way you’ll know if you also want to order something specific for wedding, too. Be sure to use the link and code on my site to save money when you purchase MMS! :) Good luck, and congrats!